Hey, guys, I was looking at four 350Z anniversary wheels (touring v2) the other day and just wanted to get some feedback on what you might think would be a good price for them. One rim has just a dime-sized bit of curb rash and the others are in excellent shape. Tires have about 50 percent life left in front and about 20 percent in rear (sizes are 225/45/18 & 225/45/18, respectively).. Any thoughts greatly appreciated. You don’t say what kind of tires and if you’re correct at 225 front and rear instead of factory 225/245, well, that’s disappointing. As is, wheels alone maybe $300. If with good tires (not some crap no names and "20% tires" are not even worth talking about), maybe $400. There’s people asking more like they’re something special but at the end of the day, nothing fancy, just another undersized stock wheel. Don’t get me wrong, nothing wrong with the stock sizes; there’s just so much room for upgrading. Last edited by MicVelo; 08-26-2018 at 05:28 AM. Anniversary and TouringV2 are two completely different wheels. Even in perfect shape, they are not worth whatever price anyone asks for them. 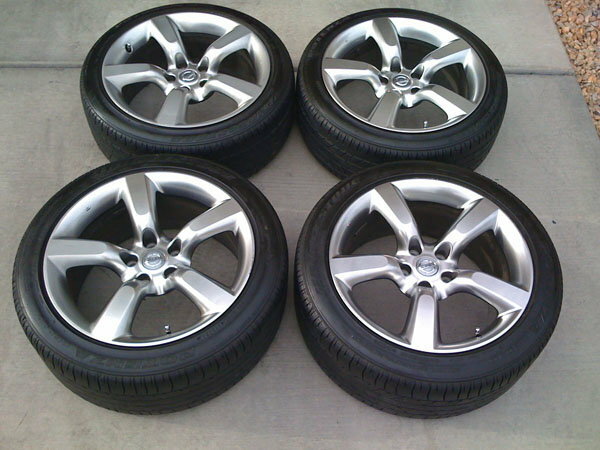 Folks selling them like to point out that they are $500 (or whatever ) for each wheel from Nissan...but whatever. Pair that with the "used" tires, which are usually some off-brand crap, and unknown history at best, then I would not pay more than $200. 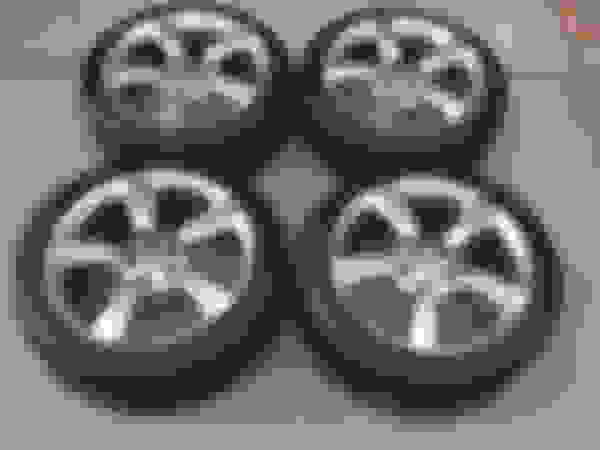 You may incur the expense of having to dismount the "used" tires that you're getting and mounting / swapping in your own set, so factor that into your calculations. These sales are driven by the people that must have one of those OEM wheels. But in reality, I think that in a lot of those cases, we're doing people favor by taking those wheels off their hands. The only OEM wheels worth a damn IMHO are the TrackV1. Last edited by jv350z; 08-26-2018 at 07:11 PM. Sorry, the 225 for the rears was a typo. They are in fact 245. Like you said, tho, they're pretty worn so not worth really mentioning. I didn't catch the name of the tires at the time I looked, but I can text and ask him. I didn't realize the anniversary and v2 were two different types. Thanks for pointing that out. I tried searching online for the different styles the 350 came with, but guess I got some misleading info. I uploaded a photo here of ones identical to what I'm talking about. Whatever they're called, I do believe these rims are staggered-type. Last edited by Ken Lorenz; 08-26-2018 at 01:01 PM. Post up pics of your Z.
Oh. I don't have 1. I was just interested in the wheels and thought this would be a good place to ask what they'd be worth, Anyway, I take it $350 would be a decent deal on 'em, so I will try to talk him down... Thnx everyone for the help. I bought a set of anniversary wheels earlier this year for 200 bucks. Rims and tires. Last edited by Franknbeans; 08-27-2018 at 01:04 PM. The only OEM wheels worth a damn IMHO are the TrackV1. I agree. Thats why I have a set of these. Work / Volk Wheels Sale! Best Price Available! We Price Match and Price BEAT! 05 35th anniversary good price? 2005 35th Anniversary Z is this a good price?